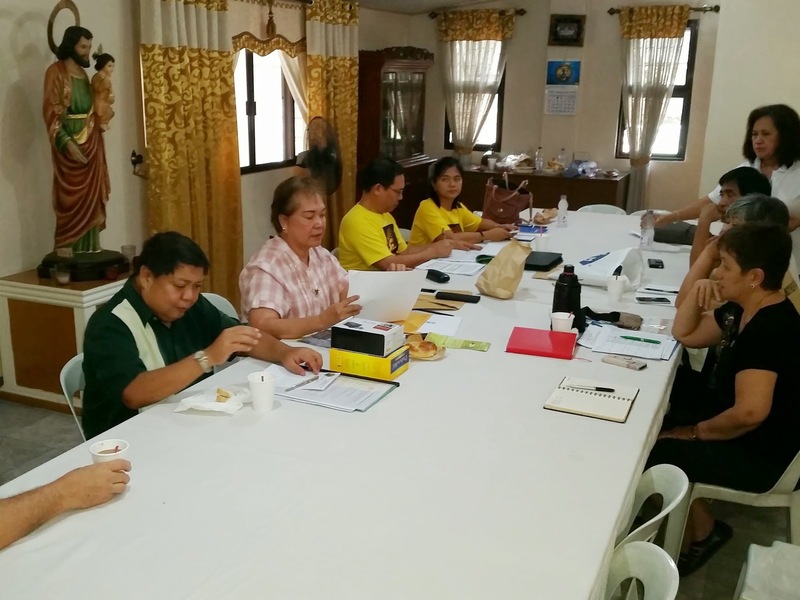 Last March 7, the SLRP PPC went on a two-day stay-in planning session at St. Paula’s Retreat House, Philand Drive. The objective was to finalize the Three-Year plan for the parish. The activity started with the Liturgy of the Hours after all the participants had registered. Fr. JB opened the session with a discussion on the Year 2015 being designated as the Year of the Poor. He shared his views and ideas on pastoral initiatives SLRP should undertake for 2015. He explained it within the perspective of the 9-year evangelization program of the CBCP in preparation for the 500th anniversary of Catholicism in the Philippines in 2021. Ate Lina Feliciano followed with a historical review of SLRP and the roles of the different PPCs through the years, their plans and objectives, ending with an explanation of the present Vision and Mission statements of SLRP. She then proceeded to synthesize these as the ingredients for crafting the 2015-2018 plans of the PPC. There were twelve major Terminal Performance Objectives (TPOs) that were agreed upon as the guideposts for the PPC for the next three years. These include TPOs on the exercise of leadership by the laity, on financial matters of the PPC, on temporalities and stewardship, on being the church of the poor and observance of the Year of the Poor, on social issues, on family and life, on the dignity and role of women, on the welfare and rights of minors and the elderly, on the welfare of families of OFWs, on the ecosystem and the involvement of the religious. Bonding and fellowship brought the members closer together as Kuya Peter and Ate Lina Tamayo, the incoming PPC Chaircouple, took charge of the one and only bonding activity of the night, a nightcap to cap all nightcaps! The game was simple: everyone had to prepare a question for each of the rest of the participants, write it on a piece of paper and give it to the participant concerned. The participant, in turn, was required to answer, in front of everybody, at least 6 of the questions given him or her. The questions covered any topic - from the serious to the facetious, from the intimate to the ones of general knowledge. It was one hilarious and riotous night that went beyond midnight. Everyone went to bed with aching bellies and uncontrolled tears from all the jokes, antics and heartful exchanges and revelations of each one. The second day had the ministry or organization head present their 2015 plans for the body’s appreciation and comments. Each of them was then given a couple of weeks to incorporate the comments into their final plans. The planning ended in the afternoon of the 8th with a smaller group tasked to meet and consolidate the submitted final drafts from the different ministries / organizations, for submission to the Diocese.